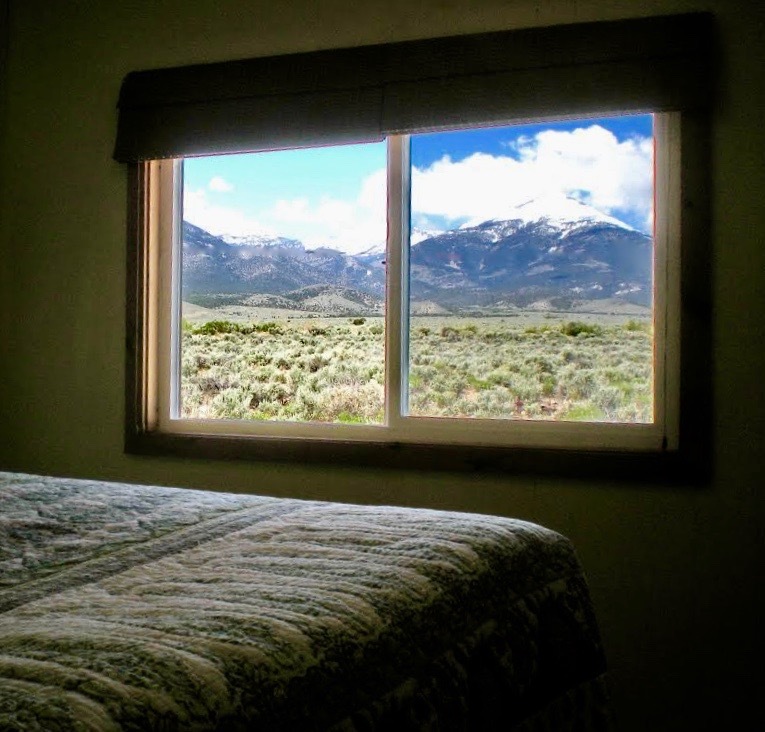 One of a kind lodging near Great Basin National Park. Welcome to End of the Trail...er! End of the Trail...er's larger bedroom has a queen-sized bed to sleep in that has a wonderful view. You get to look out across the desert to the mountains of beautiful Great Basin National Park. This room also has a dresser, desk, luggage stand and place to hang your clothes. There is a TV/DVD player as well, but with so much to see and do, you may not get around to switching it on! A smaller bedroom down the hallway has a twin-sized bed which provides a great view of our dazzling night sky. It's the next best thing to sleeping outside under the stars. 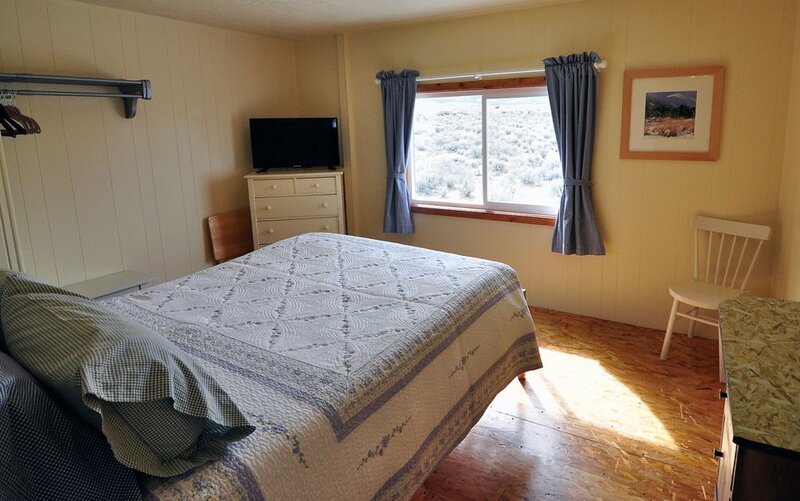 Aside from accommodating a third guest, the twin also offers extra space to store your stuff, or, if the partner you rode into town with snores, or, if you just feel like reading, there's a quiet place to retreat to! When "at home" at End of the Trail...er, most guests choose to spend their time relaxing and sipping a favorite beverage on the spacious, private deck, enjoying the panoramic views of the valley by day, and the celestial extravaganza overhead, at night. 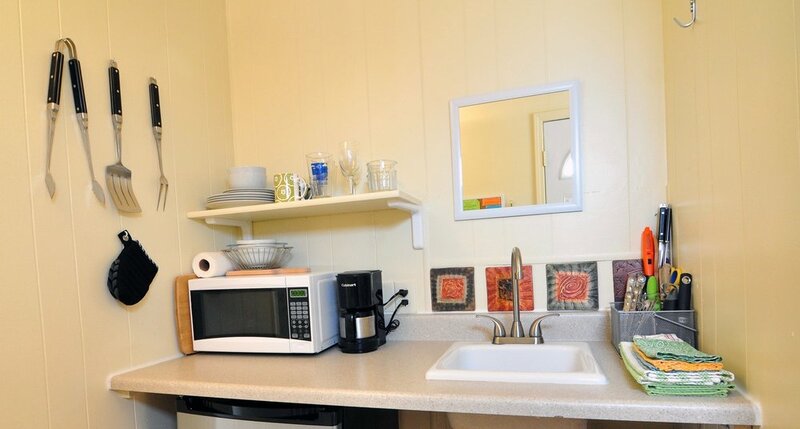 Your kitchenette is equipped with an under-the-counter refrigerator, coffee maker and microwave. Dishes and glassware, cutlery and utensils, along with coffee, tea and cocoa are provided for you. There are pots and pans as well for making your morning oatmeal or evening pasta, using the side burner of the large gas barbecue which is outside on your deck. It cooks and grills conveniently without messy charcoal or wood. 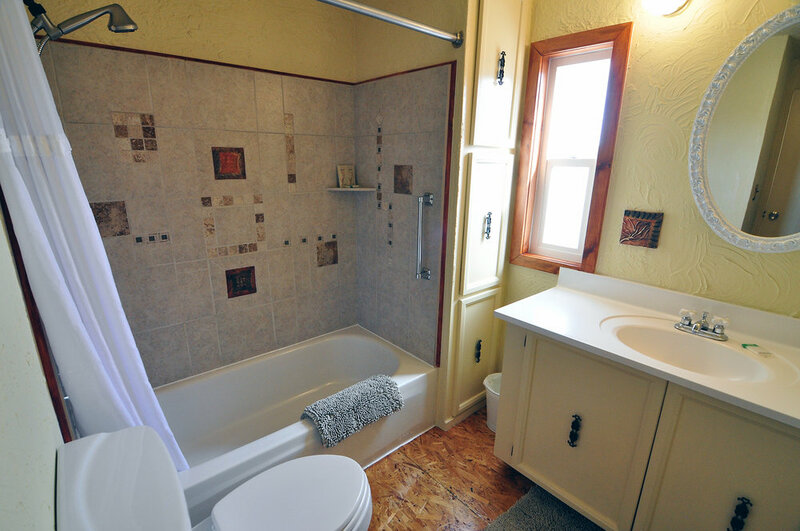 After a day of hiking, caving or climbing, or just getting to know Great Basin National Park, you might want to wash the trail dust off in your shower (tiled by local artist and "Trail Boss" Patricia). If you've stretched your legs a bit too much, or are just getting out of your car after a long drive, take a "soak" in the bathtub. We provide towels, soap, shampoo, conditioner and a hair dryer, too. End of the Trail...er is away from the highway and traffic noise. Just a few blocks from the center of Baker, you can walk to restaurants, the Great Basin Visitor Center, post office and other facilities. End of the Trail...er may not be suitable for toddlers and children under five. End of the Trail...er is not wheelchair accessible. Wide vistas from End of the Trail...er's spacious deck. Gas barbecue grill on your private deck. We are super hosts on Airbnb. click on the image above to see the trail...er's 5-star reviews. Book with us, or book with airbnb.